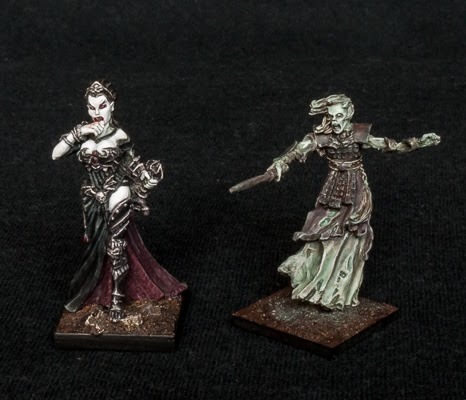 A female vampire and wraith join the ranks of the undead. The vampire is from Avatars of War and is a nice characterful sculpt. The model comes with several options, there are three right arms and two heads to choose from. I went with the wiping the bloody chin option, there are no other figures around like this. The leftover bits will be useful for future conversions. The wraith is from the Lord of the Rings range, a barrow wight. It appealed to me as far less cartoon like than the usual robed skeleton with scythe. At first I was going to paint it black robes and armour to match the vampire, but decided on ghostly glow in the end, to further reinforce that it is a wraith and not a wight (though I reckon it could be used as either if need be). The army feels more complete now. The vampire is the general of course, with the wraith her personal bodyguard. She also has three necromancers in her thrall, who she uses to resurrect and control her skeletons, zombies, ghouls and grave guard. The varghulf adds some much needed punch. That adds up to well over 1500 points and I think it could be fielded in a small battle. I also have a corpse cart and dire wolves painted, I want to spruce up the former while the latter I am hoping to replace. 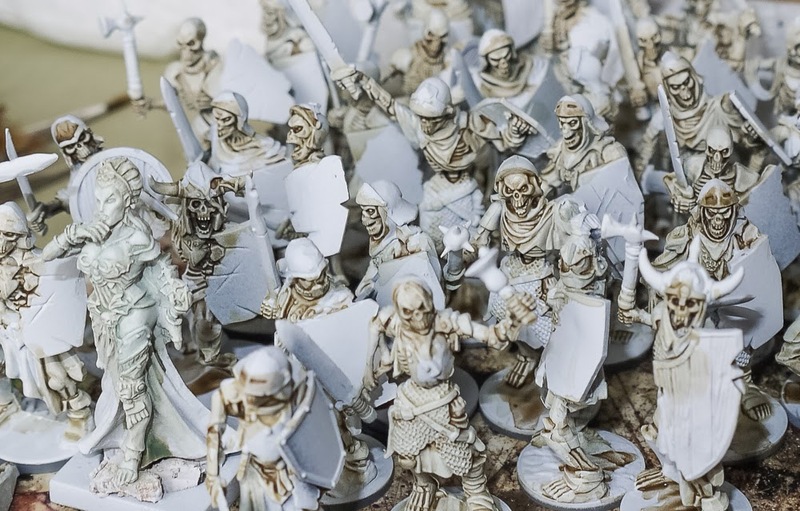 There is still plenty more to come with the army, including cavalry and flying contingents, plus more skeletons and some ghostly additions. As ever, finding the time to fit all these things in among my other projects is the biggest constraint. 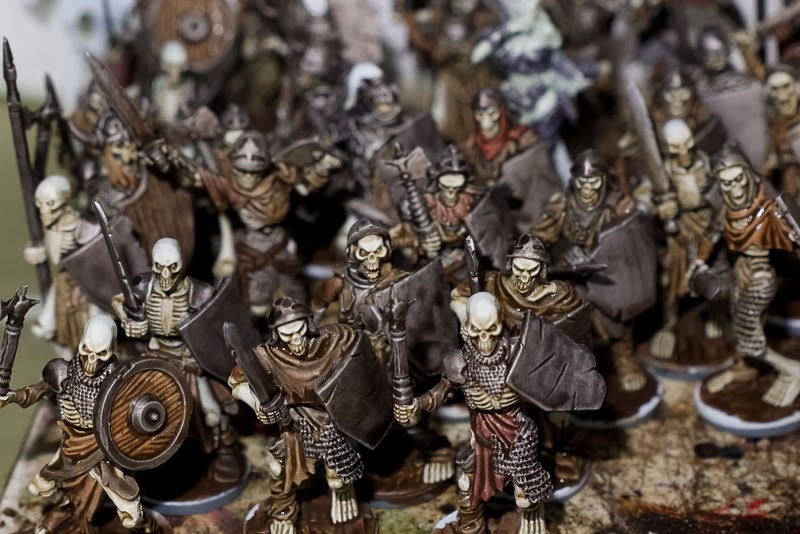 A regiment of 36 skeletons, painted and based. These are mostly mantic figures, with a few GW bits here and there, head and shield swaps for a little variety. I managed to paint them quite quickly, around two weeks over several sessions of one to two hours each. As usual, I stuck to thinned colours over a white primer, with glazes and washes doing most of the work for me. The shields and armour are black, with plenty of wear and rust. The shield design is from the Bretonnian transfer sheet, but I only had 20 to cover 30+ shields, so the most battered got a very crudely painted mock design, which was heavily weathered to cover the differences. This regiment has been a long time coming. 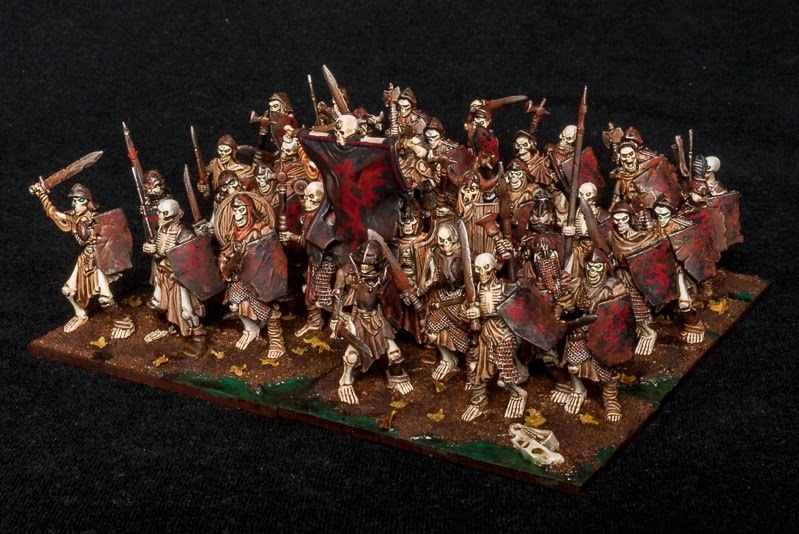 When I started the army about two years ago I wanted the skeletons to be the first unit I painted, but I had a mental block on how to go about it. 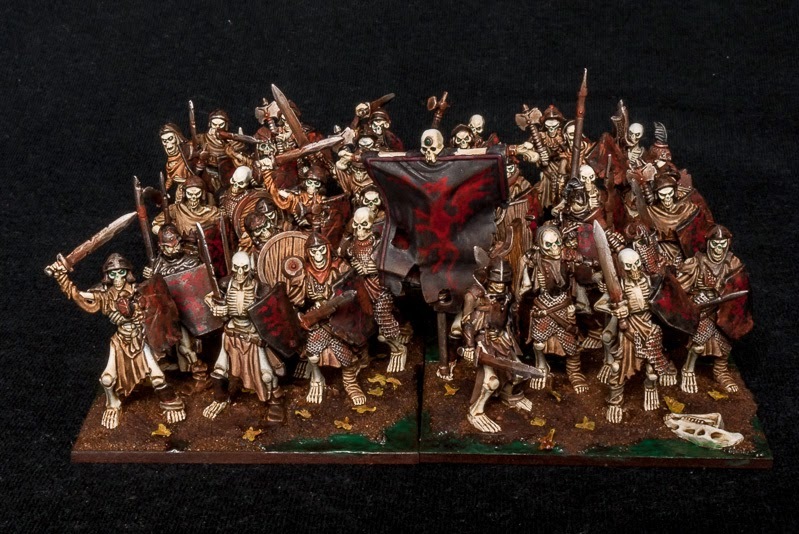 It was painting the grave guard unit in the style of Skyrim draugr that suggested the way forward with the skeletons. The black armour idea was a happy accident, suggested by a painting competition on the Warhammer forum - this unit will be led into battle by a black armoured vampire. The shields were simply the best fit from a spare transfer sheet. Serendipitous skeletons! The figures are mounted on 2mm mdf bases from warbases. These are mostly 6x4, but there are also a couple of 4x4 and another four singles at the back, which will allow me to remove casualties and slot in heroes in the front rank if required. Finally, here's an almost-a-horde shot, ranked up nine wide. The skeletons are shuffling onward. Last week they were not much more than a white mass, but now I have got the basic colours applied and started some of the shading. The metal areas are messy at the moment, I am painting them black so am not concerned about pooling, usually I would be careful to mop up any such mess. My original plan to spend an hour on the skeletons, then an hour's reward on the vampire went straight out of the window. Each session I felt compelled to finish off a particular stage - all the metal areas, all the cloth areas, etc., which took far longer than an hour. After slogging through the tedium of 36 skeletons rags, there was just no energy left in me to move on to the vampire. Still, the horde is well on the way to completion and that's a good result in just one week. The vampire will just have to wait. Avatars of War have finally released a picture of the limited edition army standard bearer, available only to backers of the indiegogo project from the summer of 2012. This was the one item I pledged for. I really liked the concepts and the sculpts at the time but was short of money and could only stump up enough cash for this one figure. I wanted to support more, thinking that I could replace my existing dwarf army, or parts of it at any rate. However, the rate of progress on the army has been slow, eighteen months in and there have been releases for about half of the promised set. So in the end I am glad I restricted myself to this one contribution. 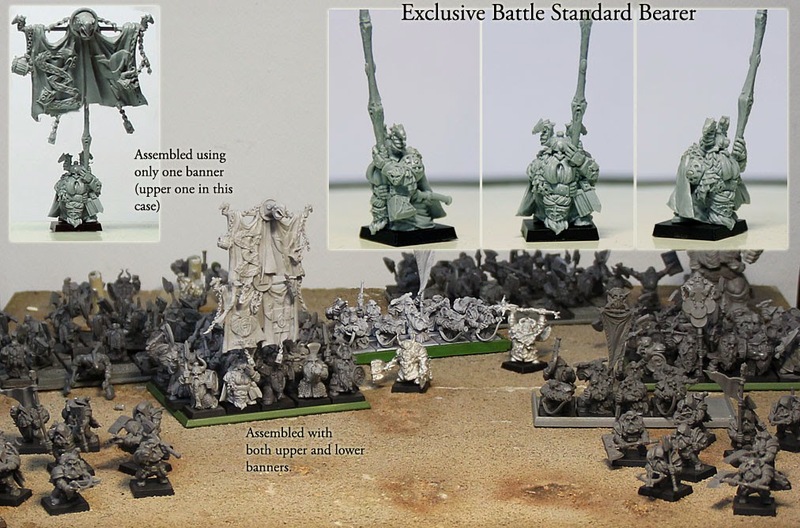 The model itself looks good, I really like the dwarf holding the banner. The massive four flags on a stick thing is not really my kind of thing, I will definitely go for a set up like that top left. That will leave me with a spare double banner for conversion purposes, probably use that on my hammerers or maybe dwarf throne, when I eventually get round to them. A nice bit of news to help cheer away the winter blues. For centuries they have lain in the dark, forgotten, overlooked. They have rested, undisturbed, while savage, bearded warriors have rampaged in the northern realms, while orcs have gathered, grown in number, raiding and pillaging unchecked. But now they have arisen from their slumber, their number is great, their purpose unknown. It may sound a bit like your average pulp fantasy nonsense, but it is, in fact, the story of my skeletons. They have lain in a box on the top of the cupboard for a good few years (I think I assembled them in 2010). 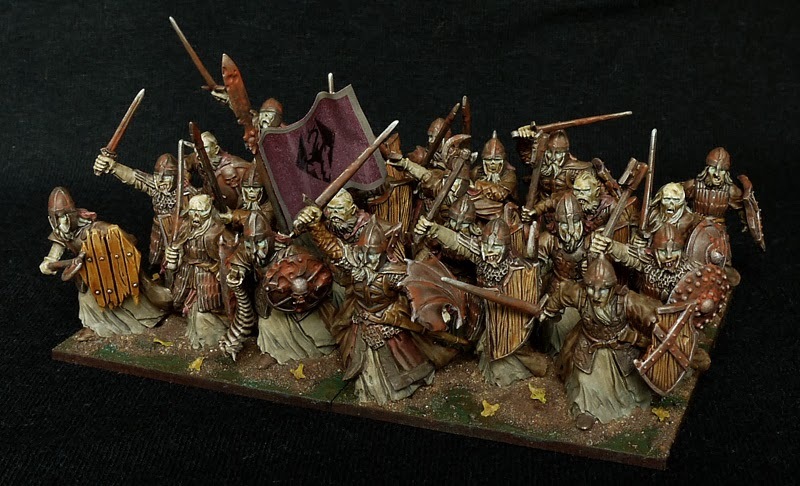 I had always intended them to be the core of my Vampire Counts army, but when I finally got that started I had a block on how to paint them and painted a regiment of zombies, then ghouls, then grave guard. In the past year I have painted Chaos marauders, Saga vikings and Orcs for Lord of the Rings. The skeletons have been on my to do list for a long time. Over the xmas holidays I have had a break from painting, a good two or three weeks in which I have tinkered with a few bits here and there, but never really felt like taking on a major job like this. On the gaming front I have enjoyed a few games of Saga, a game of Warhammer Waterloo and a couple of dry runs of Mayhem. I have also been looking online at various blogs and forums, finding myself more and more intrigued by Chain of Command and World War 2 in general. So my mind has been flitting from one thing to another, like many a wargamer I suspect. It was when I was writing my review of the year that I realised how much I enjoyed painting fantasy figures, even though I rarely game with them at the moment. The grave guard regiment and varghulf were the highlights of 2013, so I took down the box of unpainted undead and rummaged through, made a few shield swaps and then pondered. And pondered some more. And then put them back again. I couldn't face a large regiment, so I had a think about a single character. I decided I would drag myself out of the doldrums by entering the Warhammer Forum painting challenge. 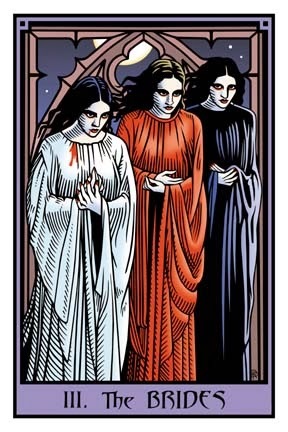 This month the theme is black and white, and I had always intended to paint up three female vampires - one red, one white and one black. A white skinned vampire in black armour would fit the bill perfectly, and easily achievable in the next few weeks. So I assembled the second of my "brides" - if you are wondering about the first bride, she can be found, started then neglected, in this post. As I was filing and glueing, I thought about where on the battlefield she would be positioned. I often think of characters in tandem with units, and decided that the black bride would have her very own bodyguard of black armoured warriors. Not very good warriors it has to be said, but that's the way it is with brainless corpses! And so the box was dragged down from the top of the cupboard once more, only this time with purpose and conviction. The skeletons have been primed white, the bones glazed with a brown-grey mix (made from horse dun, dark grey and horse brown). A second glaze with raw umber has been used to pick out the shadows and details. The next step is tedious indeed, painting all the metal and robe areas. I will alternate this boredom with work on the vampire bride, an hour on the skeletons earning an hour's reward on the vampire, that kind of thing. I am pretty confident she will be striding forth into the light by month's end, with her bodyguard hopefully not too far behind. What I will do with them once they are finished is another matter, but for the time being I am just pleased to have my painting mojo back. One thing I want to do this year is use my Warhammer Fantasy armies more often. They are the bulk and the best of my miniatures collection, it seems a shame that they sit in the cabinet, used just once or twice a year. So I have resolved to try some alternatives to Warhammer Fantasy Battle. I did once sit down and work out what I dislike about the venerable old ruleset. It was the overly destructive nature of the game. Eight edition is far more potent than previous rulesets, in that casualties mount up in each phase at an alarming rate. Combat is brutal, shooting can be pretty damaging, magic is downright apocalyptic at times. All these extra casualties is a turn off for me in two ways. As a painter rather than a gamer, I find it really frustrating that I spend hours, weeks, even months on painting a unit, only for it to be obliterated in one turn. As a cynic, I see the need for more boots on the ground as a device to squeeze more money out of the customer. I really like my armies from days of old, regiment sizes of 10 missile troops, 15 elites and 20 standard troopers seems fine to me. Huge bricks of 40 or 50 troops does not look any better, takes far longer to paint and costs a hell of a lot more to accumulate. I yearn to play but don't like the current ruleset as much as I enjoyed previous versions. So what to do? Go back to a previous version? That's the obvious solution, but it can be quite confusing switching back and forth, and anyway I do actually like a lot of the current version over previous versions. A better solution (for me) would be to use 8th edition but scale back the damage potential of each phase. This is something I have spent a little time on, making amendments to create a version 7.7, but I have never really tried it out. I have been looking into alternative systems over the past few months and have finally decided to try two different rulesets. 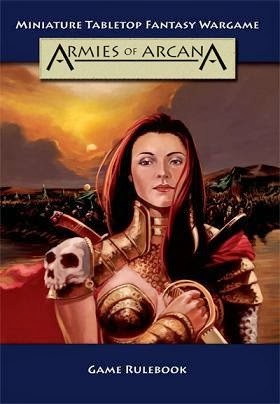 The first of these is Armies of Arcana, written by a disgruntled Warhammer player as an alternative to the big red book. I believe the first edition was written about ten years ago. The current book is the fifth edition, so it has been used and tested by hundreds of gamers and comes highly recommended on many a forum. I have bought the book and had a read through. 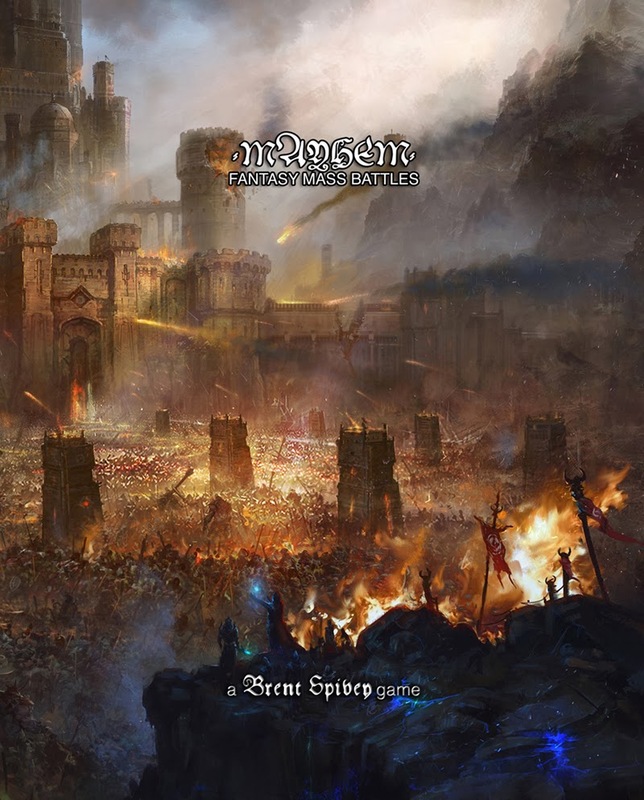 It is very, very similar to Warhammer Fantasy - single models are grouped into regiments, there is movement, shooting, combat, magic and morale effects that are almost identical. The rules are a little dense at times, taking a couple of readthroughs before it clicks, but this could be said of any new set. There are many army lists included in the book, some of which could be used as is for my existing armies. There is also a complete army design system, so I will be able to add in any missing armies/units, with consistent points calculation. In many ways, it reads like a more sensible, logical version of Warhammer. Once I have adpated the army lists I will be trying it out and writing a fuller review. The second ruleset I have bought is Mayhem, purchased as a pdf for a very reasonable price. It's a compact set of rules, only 20 or so pages in length, with no army lists, though again with a DIY points system. It's more akin to Warmaster than Warhammer, being an element based game with command decisions determining unit movement, combat, etc. My first thought was to invent army lists for my exisiting Warhammer armies and just use them, each movement tray full of troops being one element. However, I then decided I could learn quicker and easier if I tried to use elements as the ruleset intended, at the same time digging out another set of soldiers that I have not used in over a year. My Battle of Five Armies figures will be dusted down and back in action. Once I have mastered the basics, I can continue with 10mm LotR gaming, maybe expanding my collection, or I can progress to the Warhammer universe, making any adjustments that may be necessary for bases/elements. Mayhem seems to me the easiest of the rulesets to get to grips with, so that's the one I will be tackling first. I need to design army lists for the two forces and come up with a scenario, which should not be too difficult. 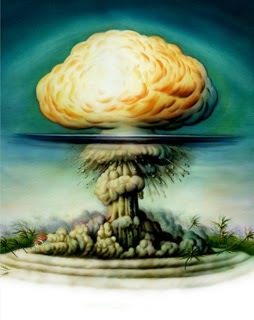 In a future post I will go into this in more detail. Out with the old, in with the new, very apt at this time of year. It's traditional at the start of a new year to take a look back at the preceding twelve months, so here's my highs and lows of 2013. The year started on a very promising note. I was determined to continue trying new games and quickly got some Sedition Wars figures painted up. Well, the painting was quick enough, the cleaning and prep work on the plastic resin mix was more work than usual. The final painted result was worth the hassle. Rather than just get stuck into a game, I checked the forums on a few rules queries and found there were lots of issues with the gameplay, confusion and lack of balance. There was a promise to get everything sorted, but it seemed to drag on and my initial enthusiasm drained away. I started to look into alternative rules sets but didn't get very far. In the end, about mid way through the year, the second consignment of figures arrived along with new cards and new rules. However, these seemed just as unbalanced as the first set and I was really put off even trying the game, which is pretty stupid really when you think about it. Maybe I should just give them a whirl in the new year. Saga proved to be a far better gaming experience. I have played many a game over the year and while the newness has worn off a little, I still feel that the system has much to offer. I have tried roughly half of the available factions and maybe need to look into new scenarios, but still like the game enough to invest time and money into building my collection of dark ages warbands. 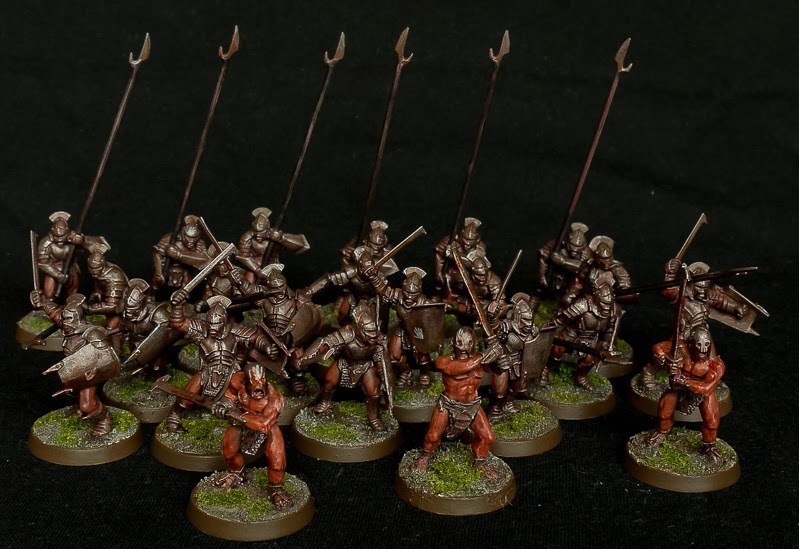 The miniatures leave me less excited, I feel that most historical miniatures are adequate and not much more, but am pleased to now have two starter warbands fully painted. Lord of the Rings was probably the biggest revelation for me this year. It's a decent set of rules with fairly quick gameplay, heavily reliant on the scenarios and background. It works well with about 30 or so miniatures per side, but starts to break down after that as it handles every combat singly. If you are using orcs and have over 60 combats to roll, it can get a bit tedious. While the game is decent I find the minis to be excellent, I can't understand why they are not more popular. I have a sizeable collection of orcs painted and a reasonable Isengard force started, with a Rohan contingent waiting for paint. The only thing that tops Lord of the Rings figures, for me at least, is my Warhammer fantasy collection. While the official figures have got steadily worse in my eyes, I have enjoyed finding and painting alternatives. My top highlight of the year was adding a unit of grave guard (built from Lord of the Rings figures!) 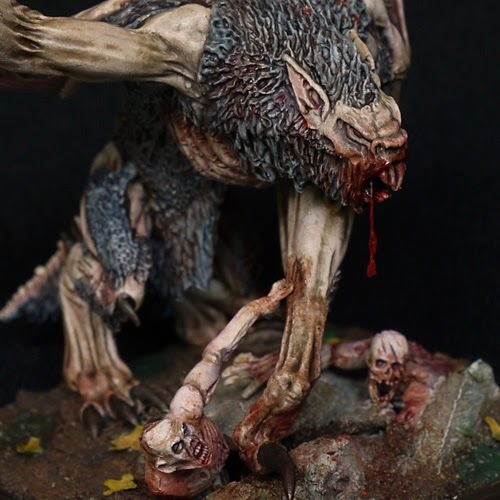 and a varghulf to my Vampire Counts army, though I only got to use them once in a game. I also added a few chaos characters to my army and played a few games with my daemons, but overall it was a very quiet year for the game that was once all engrossing. When I look at my painting list for the year, it's quite impressive compared to previous years. Most of it is shown here in this review, though I have also pretty much finished a unit of marauders for my chaos army too. I have spent less time on painting individual models, though I do have something nice to post in the new year. I have also managed to add a fair few bits to my terrain collection, so it's been a good year for my wargaming collection. My highlights for the year then would have to be painting the Vampire Counts, playing Saga and discovering the quality of the Lords of the Rings figures. If only there was some way to combine the Saga rules with the Lord of the Rings figures. Well actually, there is, but I will come back to that in a future post. The low points were probably failing to find decent dark ages figures and my declining interest in playing WHFB. If only I could use my fantasy collection without having to rely on the actual rulebooks. Again, that's something I will be looking into next year. I have some interesting plans and ideas for 2014 and will post about them in the next few days. Happy new year folks!